The Sunshine Insurance Marathon Bahamas (SIMB) is an award-winning endurance event in The Bahamas. The marathon, which was named by Runners World as one of the top 50 marathons outside of the UK, has attracted elite athletes and participants from all over the world. The event launched in January 2010 and has grown steadily ever since. Sunshine Insurance (Agents & Brokers) Ltd., the lead sponsor and organizer of the Sunshine Insurance Race Weekend series, held its annual VIP pre-race reception recently. The event was held at the estate of Sunshine Holdings Ltd. Chairman, Sir Franklyn Wilson and brought together Race Weekend sponsors, international media and the heads of several local charities, who benefit annually from the funds raised during Race Weekend. 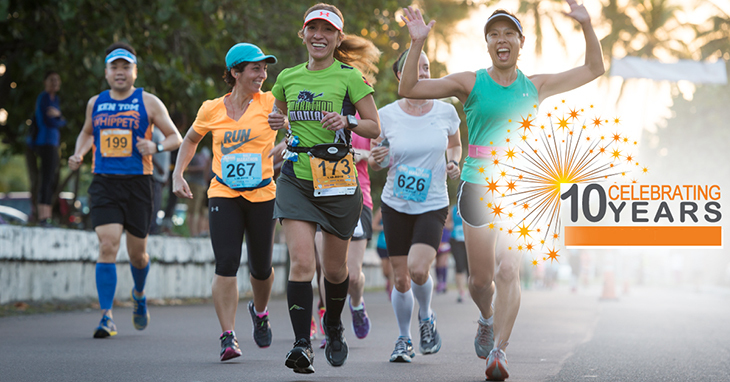 Sunshine Insurance Race Weekend is in its tenth annual running of the marathon, half marathon, relay and its ninth running and partnership with the Susan G. Komen Bahamas Race for the Cure® 5K, January 19-20, 2019. Held on the idyllic island of the capital of The Bahamas, Nassau, which is immersed in history, natural charm, beauty, white-sand beaches, aquamarine waters and hospitable and welcoming residents, Marathon Bahamas has become the pre-eminent endurance event of the country. The event features runners from 19 countries and 31 states and is supported by a large volunteer contingent from every walk of Bahamian life. The Susan G. Komen Bahamas Race for the Cure® exceeded the 2,000 mark in 2018 and is trending even higher. Sunshine Insurance, in its role as the lead sponsor and organizer for Marathon Bahamas, has fostered a strategic partnership between Marathon Bahamas and Susan G. Komen for the Cure, the global leader of the breast cancer movement and the world’s largest grassroots network of breast cancer survivors and activists – a partnership that could significantly impact the health of Bahamians, especially in the areas of breast cancer and other women’s health issues. The Susan G. Komen Bahamas Race for the Cure is an annual event not only to raise money for the beneficiaries but also to bring attention to the dreaded disease that affect so many of our Bahamian women. 100 percent of the money raised by the Race for the Cure will remain in The Bahamas to fund breast cancer and women’s health programs. Beneficiaries for the events are: The Cancer Society of The Bahamas, The Princess Margaret Hospital Foundation, Sister Sister Breast Cancer Support Group and the Cancer Society of The Bahamas Grand Bahama Chapter. With the 2018 disbursement, Race Weekend would have exceeded $400,000 in cash contributions to the beneficiaries.